The Hotel Excelsior, 3 stars of Bellaria, boasts an over forty years management and has a parking, terrace on the seafront, free WI-FI and air conditioning. Small pets allowed. 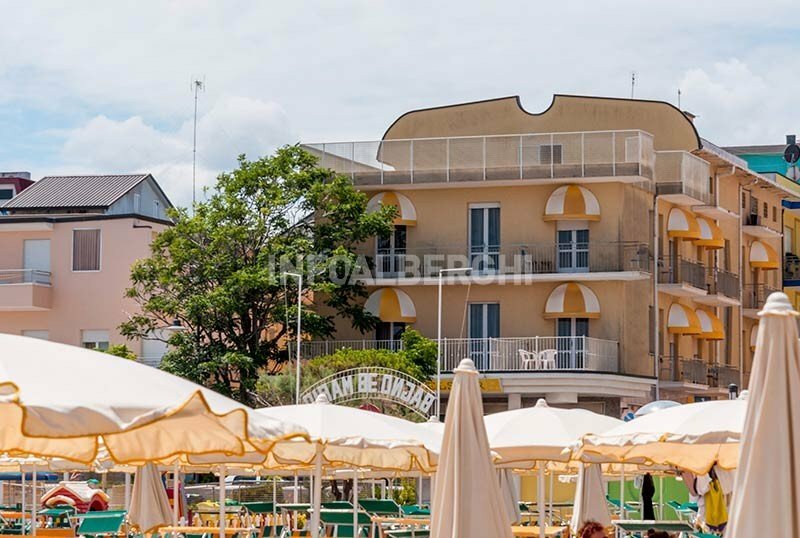 It is located on the seafront of Bellaria, a town north of Rimini, facing the beach. Hotel Excelsior has 24 recently renovated and well-furnished rooms. All rooms have: balcony (also with sea view), air conditioning, direct dial telephone, digital safe, digital terrestrial TV, WI-FI connection, private bathroom with shower and hairdryer. Minibar on request. Lift, large panoramic terrace on the seafront, TV room, bar, free bike rental (also with child seats), magazines and newspapers, library, internet point, laundry. PARKING: covered available while seats last, open for all. CONVENTIONS: beach, shuttle and organized excursions. BREAKFAST: buffet style, with hot drinks, fruit juices, croissants, homemade cakes, biscuits, cereals, yogurt and jams. Savory dishes on request. LUNCH AND DINNER: two choice menus with meat and fish dishes, followed by a buffet of appetizers and hot and cold vegetables, fruit and homemade desserts. In hotel: pediatrician and babysitter both on request, laundry, birthday parties. In the room: cribs, cribs, bath tubs, changing tables, bottle warmers. At meals: dedicated menus, vegetable soup, vegetable stock, flexible hours, microwave available, bottle warmer and refrigerator, place mats, crockery and child seats. On the beach: enclosed playground with slides, games room, changing table and baby club with entertainment. The hotel has an agreement with the baths 37 and 38, in front of the hotel, which offer: pedal boats, canoes, table tennis, elastic nets, table football, bowling and beach volleyball court, toilette, hot and cold showers, and entertainment.